How dangerous are tick bites? Just How Dangerous Are Tick Bites? Tick bites are common in heavily wooded areas and grasslands that have a high deer or rodent population. Ticks most often latch on to humans who go trekking or picnicking in the forest. In rare cases, just playing in the park could get you bitten by a tick. Ticks on human skin can easily be removed with a tweezers. Washing, machine drying and ironing can kill ticks on clothes. Awareness is the key. A single tick bite is capable of transferring several disease-causing pathogens-Lyme disease, Rocky Mountain Spotted fever etc to name a few. However, not all ticks found in the country transmit diseases. For a layman, it is difficult to decide whether being bitten by a tick at a specific location causes disease. Hence, ensure that you follow a first aid procedure and consult your doctor in case you are not sure. In this guide, we will cover just how dangerous tick bites can be. Awareness and education can help prevent many potential problems. Deer tick bite causes Lyme disease. Lyme disease starts with a fever. If untreated, it progresses to migraines, fatigue, arthritis, disorders of the central nervous system, and cerebral palsy. The disease vector is a bacterium and Lyme disease can easily be treated with antibiotics. Preserve the ticks you have picked off of human skin and clothes because your doctor will be able to identify a deer tick and provide treatment on time. Lyme disease often gives rise to lingering symptoms. Many victims of this disease continue to suffer from debilitating pains for several months and years following Lyme diagnosis. Elderly people are especially prone to these lingering effects. Pets can also get Lyme disease. Older dogs that have been bitten tend to suffer joint aches, lethargy, confusion and other neurological symptoms. Wood tick bite causes Rocky Mountain Spotted Fever. It leads to fever, rashes, headaches, lethargy, confusion or hyperactivity based on preexisting health and immunity of the patient. Muscular aches and pains are also a common symptom of Rocky Mountain fever. The disease vector is also a bacterium and like Lyme disease, Rocky Mountain Spotted fever is also usually cured with antibiotic treatment. Dog tick bite causes Tularemia. Sometimes, ticks on humans that are transmitted from infected wild beasts can also lead to this disease in humans and pets. Symptoms of Tularemia can be seen as early as three days from the tick bite and are fully visible by the end of two weeks. Symptoms are skin lesions, red and inflamed face and eyes, and moderate to high fever. 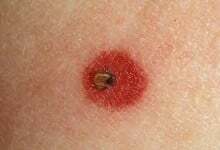 The disease vector is a bacterium and even if lesions are not seen, if a mild to high fever is seen between the third and fourteenth day of a tick bite, it is recommended to consult your doctor and get antibiotics. Deer tick bite causes Babesiosis. Unlike Lyme disease, the disease vector is a protozoan. There are no specific symptoms for Babesiosis. If a deer tick bites you and there are no symptoms, get a blood test done for Babesiosis. In some cases, Babesiosis does absolutely nothing but in other cases, it may lead to death. Your doctor will prescribe Anti-protozoal agents to treat Babesiosis. Rodent tick bite causes Tick borne relapsing fever. Symptoms are fever, muscle ache, joint pain, nausea and headache. This is also a bacterial infection that can be treated with antibiotics. Deer tick bite causes Tick-borne meningoencephalitis. Primary symptoms are high fever, headache, fatigue, muscle pain, nausea, vomiting. The secondary stage is meningitis and encephalitis. The disease vector is a virus and serum testing can help reveal this virus. It must be treated before the onset of secondary symptoms. Once the secondary symptoms are seen, recovery takes anytime from months to years. In some cases, it causes death. Tick bites cause a plethora of other illnesses that are usually treatable. Untreated illnesses in some cases lead to permanent impairment or death. Most common illness, however, is Lyme disease that is caused by deer tick bites. Ticks on humans are easy to get rid of. Easier still is prevention. If you are accidentally bitten by a tick, immediately but carefully remove the tick from your body and bag it. Your doctor will be able to recognize the tick and put you under observation. Tick bite treatment is readily available and safe. The key however, is prevention and timely diagnosis and treatment.